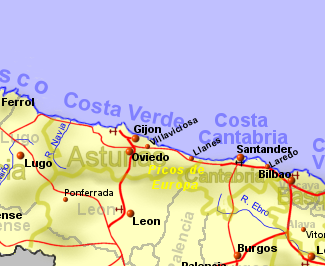 The Costa Verde or the green coast (not to be confused with Green Spain, a term more usually to describe all of the north north coast and Galicia), runs the length of the Asturias region. Situated on the northern coast of Spain, it does not suffer the lack of water experienced by the costas on the Mediterranean or the Costa de la Luz further south. As a result, it enjoys relatively lush and attractive plant growth amongst the mountains that run down to the sea. The coastline is typically rugged with clifftop roads and golden sandy beaches, interspersed by attractive fishing villages and any tourists you happen to meet are likely to be Spanish.